When prominent Italian banker Frederico Castiglione is murdered in an apparent jewelry robbery gone wrong, things are not what they seem. Former CIA Director Craig Page is enjoying his new life as Italian race car driver Enrico Marino—but when he hears that his friend and sponsor has been found dead, he suspects foul play. Shortly after Castiglione's death, Italian banker Andrew Goldoni is asked to sell—or else. When he refuses, his daughter goes missing. 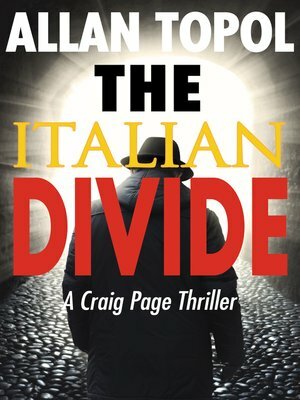 In The Italian Divide loyalties lie deep, dangerous alliances are made to be broken, and organized crime is omnipotent. Allan Topol's latest Craig Page thriller is an electrifying foray into the world of international intrigue. Against blackmail, extortion, and treason, can Craig Page still prevail?